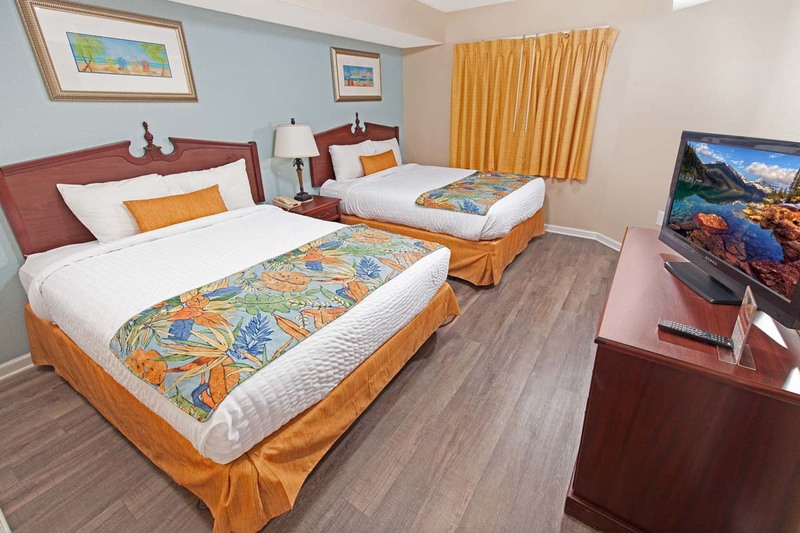 The accommodations at Atlantica Resort Myrtle Beach couple the refreshing excitement of vacation with the conveniences of home to bring you a beach vacation that is like no other. 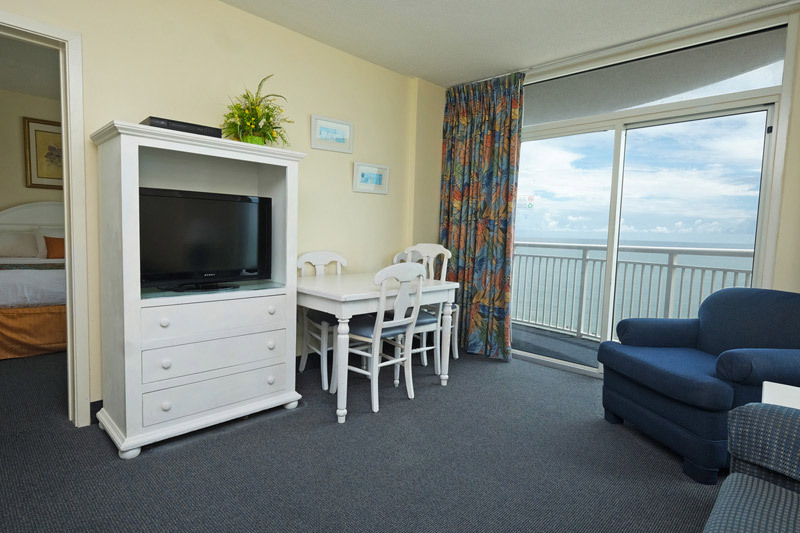 This Myrtle Beach downtown resort offers beach front suites and condos with lovely views of the Atlantic Ocean. 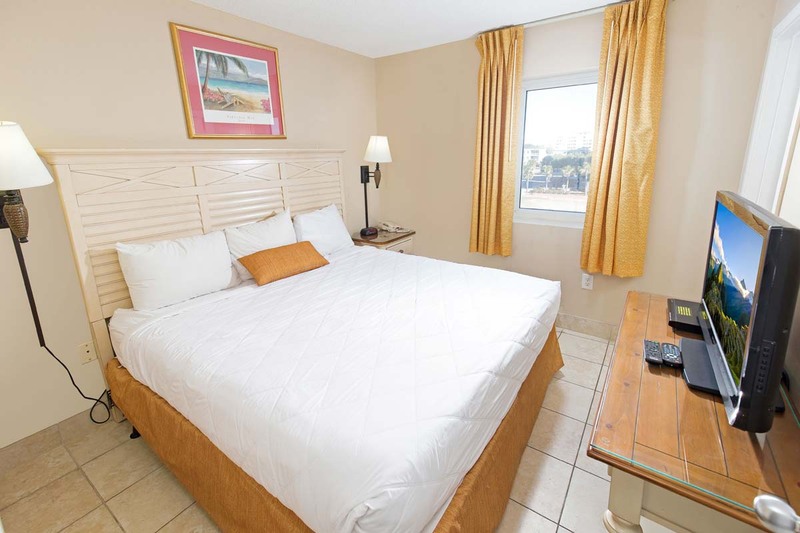 All of the condos in this family friendly hotel come complete with fully-equipped kitchens, comfortable bedding and furniture, WiFi Internet, and much more! 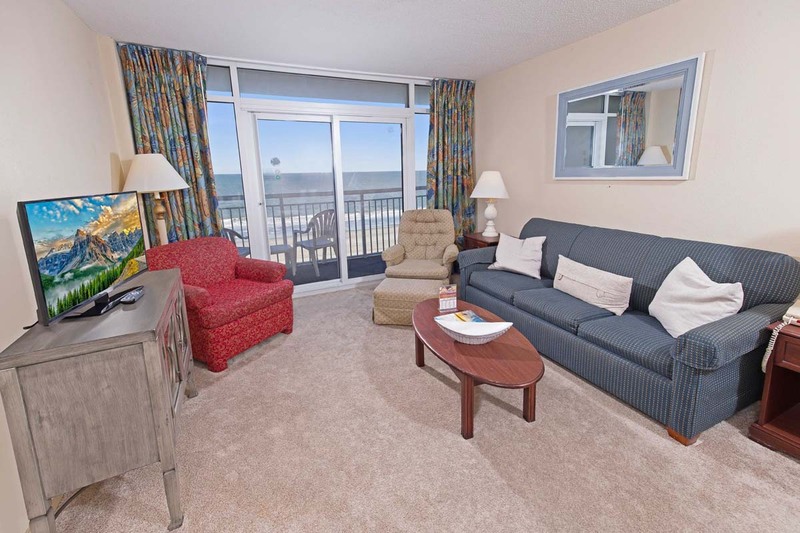 Whether you're in need of two bedrooms near the Convention Center Myrtle Beach or you are attending a family reunion in Myrtle Beach, you are sure to find that the condos at Atlantica Resort can fit any preference. 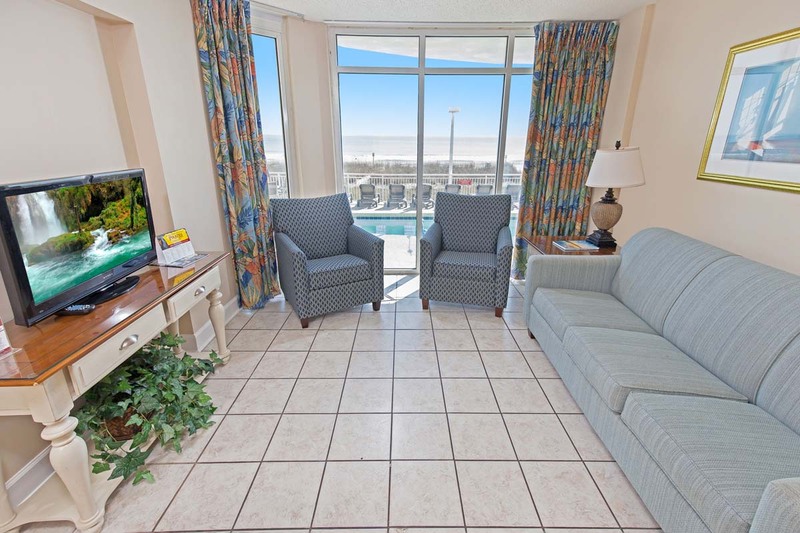 Browse our unit types below to find the oceanfront condo that is perfect for you! 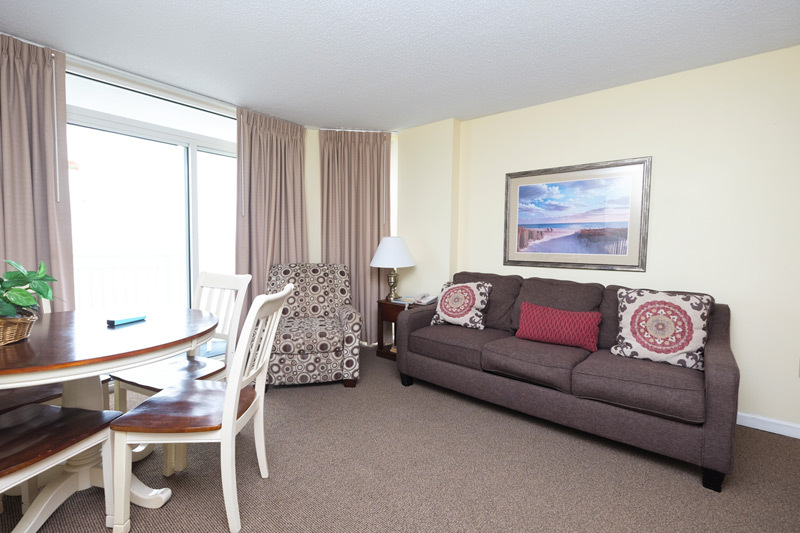 Located at the Atlantica North Tower, this Oceanfront One Bedroom Condo has direct access to the outdoor pool and is just half a block away from the Atlantica South Tower and the amenities it offers. The unit features 2 Double Beds, Sleeper Sofa, Private Balcony, Iron and Board, Hairdryer, Two Flat Panel TV's, Full Kitchen with Coffee Maker, and Wireless Internet Access. This unit will accommodate 6 people max. Located at the Atlantica North Tower, this Oceanfront Two Bedroom Condo has direct access to the outdoor pool and is just half a block away from the Atlantica South Tower and the amenities it offers. The unit features a Queen Bed in the Master Bedroom, Varied Bedding in the second bedroom, Sleeper Sofa, Private Balcony, Iron and Board, Hairdryer, Three Flat Panel TV's, Full Kitchen with Coffee Maker, and Wireless Internet Access. This unit will accommodate 6 people max. Located at the Atlantica North Tower, this Oceanfront Two Bedroom Condo has direct access to the outdoor pool and is just half a block away from the Atlantica South Tower and the amenities it offers. The unit features a King Bed in the Master Bedroom, Varied Bedding in the second bedroom, Sleeper Sofa, Private Balcony, Iron and Board, Hairdryer, Three Flat Panel TV's, Full Kitchen with Coffee Maker, and Wireless Internet Access. This unit will accommodate 6 people max. 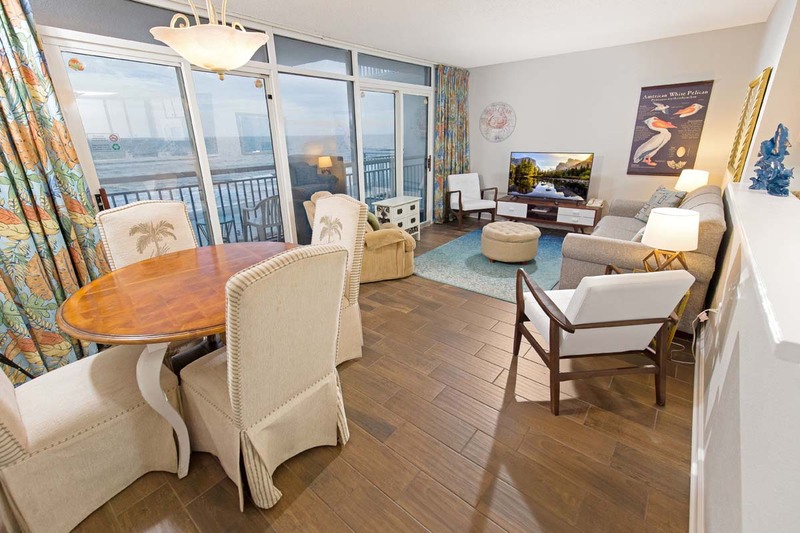 Located at the Atlantica South Tower, this Oceanfront One Bedroom Condo has direct access to the Indoor Pool, Indoor & Outdoor Spas, Lazy River, Children's Pool, and is just half a block away from the Atlantica North Tower and the amenities it offers. The unit features 2 Queen Beds, a Sleeper Sofa -OR- Murphy Bed, Washer & Dryer, Private Balcony, Iron and Board, Hairdryer, Two Flat Panel TV's, Full Kitchen with Coffee Maker, and Wireless Inteet Access. This unit will accommodate 6 people max. Located at the Atlantica South Tower, this Oceanfront One Bedroom Condo has direct access to the Indoor Pool, Indoor & Outdoor Spas, Lazy River, Children's Pool, and is just half a block away from the Atlantica North Tower and the amenities it offers. The unit features two Queen beds located in a bedroom separate from the rest of the unit, a Sleeper Sofa -OR- Murphy Bed, Washer & Dryer, Private Balcony, Iron and Board, Hairdryer, Two Flat Panel TV's, Full Kitchen with Coffee Maker, and Wireless Internet Access. This unit will accommodate 6 people max. Located at the Atlantica South Tower, this Oceanfront Two Bedroom Condo has direct access to the Indoor Pool, Indoor & Outdoor Spas, Lazy River, Children's Pool, and is just half a block away from the Atlantica North Tower and the amenities it offers. The unit features a Queen Bed in the Master Bedroom, Varied Bedding in the second bedroom, Sleeper Sofa, Washer & Dryer, Private Balcony, Iron and Board, Hairdryer, Three Flat Panel TV's, Full Kitchen with Coffee Maker, and Wireless Internet Access. This unit will accommodate 6 people max. Located at the Atlantica South Tower, this Oceanfront Two Bedroom Condo has direct access to the Indoor Pool, Indoor & Outdoor Spas, Lazy River, Children's Pool, and is just half a block away from the Atlantica North Tower and the amenities it offers.The unit features a King Bed in the Master Bedroom, Varied Bedding in the second bedroom, Sleeper Sofa, Washer & Dryer, Private Balcony, Iron and Board, Hairdryer, Three Flat Panel TV's, Full Kitchen with Coffee Maker, and Wireless Internet Access. This unit will accommodate 6 people max. Signup to Receive Monthly News and Money Saving Discounts from Atlantica Resort & Beach Vacations.